HAVE YOUR HYGIENISTS REACHED THEIR FULL POTENTIAL? We are the Clinical Training Team for the Scheduling Institute, the largest dental consulting company in the world. We have delivered motivational, challenging, and results-oriented trainings in over 4,000 offices across the globe. We have 18 successful clinical trainers with over 400+ years of “in the trenches” experience. We truly believe that if you focus on providing the best quality care to all of your patients, your production will go up. Watch the video to learn how we help hygienists reach their full potential! Have your hygienists reached their full potential? Schedule a complimentary Hygiene Analysis or call us today at 877-921-3939 to find out! Our Hygiene Production Bootcamp is an accelerated program that was created to turn your hygiene department into its own profit center. A certified trainer will be in your office every 90 days to give your hygiene department the tools they need to provide the highest quality care and easily increase production by 25% or more…Guaranteed! Whether you are looking to address a specific area in hygiene or you are looking for a 12-month commitment to increase hygiene production by 25% or more, we’ve got the right program for you! 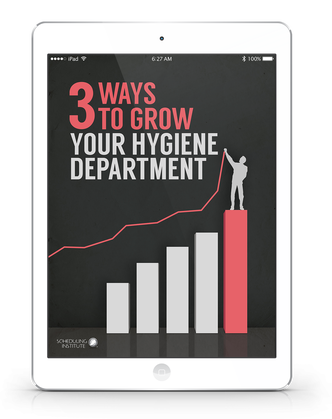 A hygiene department should be producing at least 33% of total office production. Our Mix of Service On-Site Solution training will get your whole team on the same page with treatment recommendations and teach your team how to increase production through added services that your patients not only need, but want! Cancellations are a common theme in many practices. One broken appointment in hygiene adds up to $30,000 dollars a year of loss production. This training will give your team the verbal skills they need to reduce those cancellations and keep your schedule full! This training is recommended in conjunction with every Clincial Training to ensure your team is implementing the material they have been taught. We’ll coach your clinial team throughout the day as they see patients to help them overcome objections and hone their verbal skills. This training will ensure that you see results the very next day! Are your processes slowing you down? This training will streamline your processes to make your team more efficient. Discover what ‘lean’ methodology means and how to apply it to your practice. Your processes will run much smoother and production will increase! The #1 Lawsuit in Dentisitry today is failure to diagose and treat periodontal disease. Our Profitable Perio training will help your team develop a solid periodontal program to help keep you and your hygienists from getting sued. The best part is that your patients will see value in the treatment you recommend. This NEW training is the ultimate accountability day! We’ll watch your hygienists with Live patients in the morning and coach them in the afternoon to ensure they are implementing the tools they have been taught. We’ll help them discover unrealized revenue in their day-to-day schedule and identify missed opportunities. Your hygienists should run their own “business within a business.” The Vision and Growth Training gives them the tools they need to start thinking like an entreprenuer. We’ll help them set goals and develop a game plan to hit their goals! After all, they are the only other provider in the practice besides the doctor. Are you constantly running behind or working through lunch? Is your production fluctuating up and down on a daily basis? This 2-day training will uncover the barriers keeping you from consistently hitting your daily gaols AND teach your team how to schedule an ideal production day. Click the button below or call us at 877-921-3939 for a FREE consult call to learn how we can help you increase quality care and maximize production. Click the Button below to get instant access to your Free Hygiene Report. Click the Button below to get your Free Hygiene Analysis. Fill out the form below and we'll send you a link to subscribe to the HPL podcast!